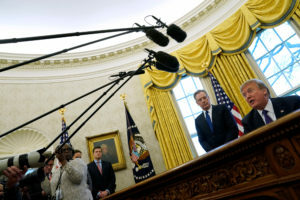 WASHINGTON — The White House is preparing to announce tariffs on imported steel and aluminum that would offer temporary exemptions to Canada and Mexico, a shift that could soften the blow amid threats of retaliation by trading partners. President Trump announced stiff new tariffs on imported steel and aluminum on Thursday at a meeting with industry leaders. The president said the U.S. needed to crack down on countries flooding American markets with cheap metals. Judy Woodruff sits down with Greg Ip of The Wall Street Journal to discuss what this means for Americans and the fears it could spark a trade war.